Mesa Police Department’s top cop, Chief Frank Milstead, took the “Ice Bucket Challenge” to raise money and awareness for support for first responders such as police and fire. 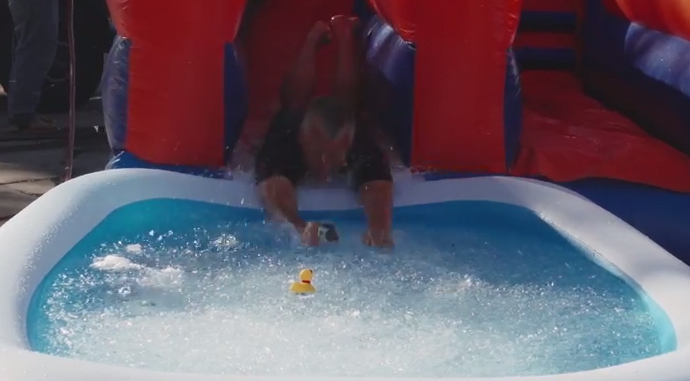 In an event sponsored by WeFixUglyPools.com and The Kenny Klaus Team, amongst others, Chief Milstead went down an inflatable waterslide, ending up fully submerged in 33 degree water. The charity supported by the event was The 100 Club of Arizona, which exists to provide immediate financial assistance to families of public safety officers and firefighters who are seriously injured or killed in the line of duty, and to provide resources to enhance their safety and welfare. Donations can still be given to The 100 Club of Arizona by visiting The 100 Club of Arizona or by contacting Barb McReynolds of the Mesa Police Department at 480.254.4023.